It was halfway through the snoozefest of S-Pulse v Marinos when I checked my phone to see a tweet asking me what I thought of Ljungberg joining S-Pulse. I was completely baffled and just went back to the job of shouting on my team. When the ref mercifully blew the full time whistle, a mate who cheers from a different section came over looking cautiously excited and repeated the news. I had to sit down and have him tell me again very slowly. 34? Yeah, that's about right for a top class European player to play out his last couple of years abroad. Noone is naive enough to think we're getting a player at the top of his game, but it's far from too old and many top players in Japan are around that age. It may well be his swansong career step, but we won't be expecting anything less than 100% from the super Swede. He's a natural talent and can definitley still succeed, but it must be part of the wider team. A lot has changed since the early 90's when world stars graced the fledgeling J. League with their presence. It's a much more serious business these days, and the addition of Freddie has to be part of the wider plan, not just a ploy to flog a load of shirts and season tickets. That said, the impact he may have on ticket sales is huge, and that is never a bad thing. It will also raise our profile abroad which is a vast untapped market. His experience and knowledge will be a huge benefit for our youngsters like Takagi and Genki and the potential for a partnership with Ono is mouth watering. He's not a player with a long history of injuries, but scanning his club record after Arsenal gives us reason to be slightly wary. He's not been at any team for long, and I've no idea what happened up at Celtic, but can we be certain he's going to be here until the end of next season as promised? If we can, then next year may be an extremely exciting one. For the remainder of this term, let's see him settle in, work hard and build up an understanding with the rest of the team. If this is going to work then that's the absolutely crucial thing - he has to be a cog in the bigger machine, not just the big name foreign star running around on his own. Welcome though, Freddie - I'm 100% behind you, Ghotbi and the boys, and believe it's going to work. Ole! After Krueger and Mercury, and ahead of Prinze Jr, the world's third most famous Freddie has signed until the end of next season. The ex Arsenal great is quoted as hoping to make his début in a fortnight - in time for the derby. Exciting? Just a bit. It's been a good few years since any Japanese team has got hold of a major name, and he's certainly our highest profile signing since Massoro. He's got the remainder of this season to show he's still serious about his football and then next year to fire us to GLORY. A game so instantly forgettable it's already retreating rapidly into the dark recesses of my mind, never to return. Before it's gone for good, it's worth noting that most of our twelve shots were long range efforts and never really looked like breaking the deadlock. Marinos had the more clear cut chances but blew them. I'm in danger of falling asleep typing this up, so I'm going to leave it. Some matches are just not very good. In the end, we were lucky to get the draw, but this was a game we should have had wrapped up by half time. Despite the early blow of losing Takahara, to say we dominated the first half would be an understatement. Yamagata looked bereft of any options besides attempted counters and long balls and we were leisurely - too leisurely - knocking the ball all over the pitch while gently crafting out chances. But apart from Brosque hitting the bar, having run onto a perfect through ball by Jong a Pin, did we really force their keeper into too many saves? But it felt like we were there for a practice game and that the goals were just a matter of stepping up the pace. But then came half time and in 15 minutes we forgot how to play. Well, that and Yamagata remembered they were taking part in a game of football and starting behaving accordingly. Montedio came out stronger, but we took the lead from an Omae free kick swung over to the far post. Lucky for us, the Yamagata keeper fell over just as it was reaching Iwashita, and he headed home unimpeded. But then at one up it all went a bit wrong. We sat back, inviting a desperate Yamagata side onto us, and they really did need no invitation. They were allowed to play, and from then it was just a matter of time. It took a spectacular goal line clearance from goal scorer Iwashita to keep us in the lead, but the home team finally equalised in the 80th minutes after a ball hiked forward was met by the head of Yamazaki on the edge of the area. He directed it past Yamamoto who was caught off his line. It went from bad to worse when Muramatsu left out a leg in the area and the blue and white attacker threw himself, up, over and then down to gain a 90th minute penalty. The penalty was low and into the bottom left corner, but Kaito went the right way and at full stretch palmed it over one handed. It really was a stunning stop and a save that would have shattered my right wrist (God forbid) into a thousand pieces. It got us out of jail, but seriously. we should have had this game won long before Montedio (who if they stay up I'll be very surprised) were allowed a sniff. BUT! Jong a Pin was all over the place, winning balls, taking it forward and creating chances. It'll take time until all the cogs are moving in sync but he looks like a class act. Something I'm keen to remind myself is that this is a transitional year (some people were predicting a struggle to stay up, remember) but as long as we are learning and growing (and I believe we are), we have a lot to look forward to. The way we played in the first 45 is a glimpse of what we can do and how we can play. A long personal video of Kaito's penalty save. Saturday's 3-3 thriller with Cerezo Osaka was host to 50 special guests from Yamada City, Iwate prefecture; a town almost completely destroyed in the March 11th tsunami. A number of junior high and high school students and family members, numbering around 50 in total, were presented with the invites by Takahara. "Thank you Takahara, Thank you S-Pulse"
I glad they were given a crazily entertaining, maybe if not winning, game to enjoy, and I hope everyone went home with some good memories of Shimizu. You are truly welcome back any time. Nice job Takahara, and nice job S-Pulse. That has to be amongst the most insane final 15 minutes of a game I've ever watched. 75 minutes gone and we're coasting along at 1-0. Osaka had just brought on another striker in Bando, but Kaito had been keeping the visitors at bay with a string of stunning stops, and if we could keep it tight we should be good for three points. Well after five goals, several more gilt edged chances, four yellow cards and some of the most cynical time wasting you'll ever see, it finally ended 3-3, and I needed a lie down. It started with a penalty to equalise, and straight from the restart Osaka scythed down the left wing, swung it in, and there was Bando again. Two one in the blink of an eye. Kick off, and within seconds Lopes goes down on the floor like a sack of crap and doesn't move. The play acting and time wasting started right on cue. He was stretchered off, we pressed and equalised two minutes later through Takagi. Suddenly Cerezo were not quite so interested in running down the clock and starting playing again. It was Bando for the 11 minute hattrick on 87 minutes to give the visitors the lead after rounding Kaito and firing home. The away fans went nuts, as you would expect. Having come back against the odds once, I'll be honest in that I feared the worst at this point. Cerezo had only three minutes to hold on and I had no doubt they'd do all they could to not let us play. But credit where it's due (to us), we just did not stop. We were in a hole but were not going to go down without a fight. Just two minutes after their third, a cross to the far post from Omae was met by a forward stampeding Takahara who headed powerfully, unstoppably home. The place erupted. Takahara and Cerezo keeper Kim Jin-Hyun both saw yellow after getting into an altercation when Kim stopped Taka grabbing the ball for a speedy restart. Fair play to Taka, he wasn't going to let such pettiness go unchallenged. With five minutes stoppage time, the game was now flowing in our favour and a Bosnar header which was agonisingly straight at the keeper (he had little time to properly direct it) and a last minute counter attack when Eddy should have probably passed were both chances which might have brought goals, but the game finally ended up 3-3. It was a frantic end to a game we maybe should have won, but after creating a mess, we did very well to come back. The referee was again poor and it effected the game, but our mistakes were our own. New boy Jong-a-Pin (nickname Kara, by all accounts) who is a left back by trade played as a defensive midfielder behind Ono and Edamura, and the big man had a good début. Confident on the ball, forward looking, he was rarely troubled when put under pressure. He looks like he's going to grow into a vital part of our team, and very pleased I am to see him in orange. Away in Yamagata on Wednesday. I was half planning on going, but just can't make it, so I'll be watching on the box. Yamagata will be playing J2 next year barring a ferocious fight back in the next few months, so three points is a must. More goals, please Taka - with each one you're proving more and more doubters wrong, and I love you for it! Yet to find any. Will add them as and when. The official press release came today to confirm the Dutchman's signing for S-Pulse, as was reported last week. 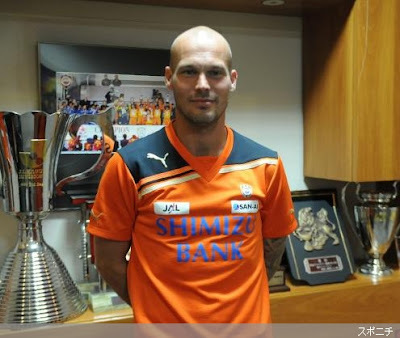 Welcome to Shizuoka, big man! Looking forward to seeing what you can do. With his addition, our foreign player count is up to three, but either of our Aussies counts as the one Asian foreigner. So we may still be seeing another overseas player from Ghotbi's international connections as we still have one non-Asian space left. No time, no time! I'll be honest with you. I drank too much before the game and don't remember with too much clarity the events which led to our first win in four. I'll have a quick go though from memory. Kaito was recalled for Usui who had let in 12 in three games. Not all his fault by any means, but it can't do a keeper's confidence any favours. Takahara was back leading the charge and Edamura made a rare start. The first half was bereft of too many chances, but it was Eda who opened the scoring right after the break. Ono, from another of Ota's excellent crosses, doubled the lead. Shinji found himself deep in the Omiya box, and with a couple oif deft steps lost his marker. From behind the goal I thought he' d hit is straight it straight at the keeper, but how could I doubt him? It was aimed perfectly through his legs. 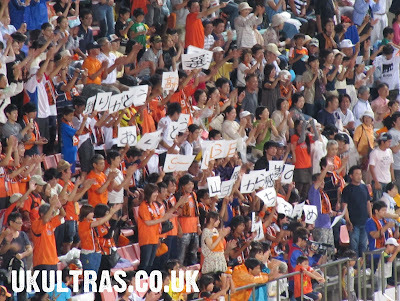 At 2-0 Omiya really had us hanging on for a spell and we just couldn't hold onto possession. But for a cracking Kaito stop it would have been 2-1 and the way it was going a come back wouldn't have been unlikely. But we held on and a belter from Takahara put the game beyond reach for the visitors. So a good result for sure, but still tempered by the last three games. New signing Jong-a-Pin was there and was seen chatting away to Ghotbi before the game. Maybe we'll see him as early as the Cerezo match next week. Aaaah, time up! I'm off to Aichi for the day. Will do the Ghotbi says bit later or tomorrow or whenever. See ya! News has been rife around the tubes that Dutch defender Jong-a-Pin is set to sign. 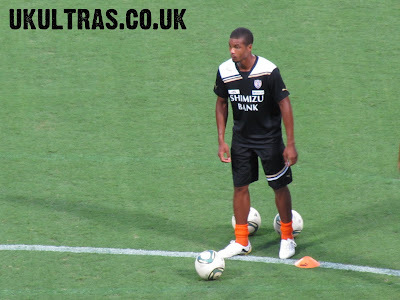 The 6 foot 25 year old is currently attached to Heerenveen but is out of contract this summer. The 2008 Olympic international has been playing as a left back but is said to be able to play as a defensive midfielder or at centre back. This is encouraging as Ota has earned himself an international call up this season thanks to his performances as left back. Well, as soon as anything is official I'll be tweeting and posting it here, so watch this space. It's an interesting signing, the first of Ghotbi's reign, and looking at our last three games, one we probably need. In my experience, the Dutch speak excellent English and this would be a major boon in helping him settle in. With Eddy, Alex, Ono and of course Ghotbi (and several others) communication shouldn't prove any kind of problem. Here's some selected clips of Jong-a-Pin. As if the fact he's wearing a very Brighton-esque strip wasn't enough, it's dotted with HEARTS! :D Love it. You have got to be joking. Well, at least it wasn't four. Oh, hold on, as I type this, it is four. :( Another 94th minute goal for the opposition. Are we trying for our worst ever goal difference? What the hell has gone wrong these last three games? This season was always going to be transitional, so here's to us finding our feet again and stopping this horrific run at home to Omiya on Saturday. We only drop one place to 10th thanks to a bit of a cushion from our recent good run. I don't think anyone except the current bottom three will be going down, so let's not panic or get on anyone's back just yet. But seriously, though. This can't go on. Translated back to English, so not his exact words, but the gist. "We gave everything we had. We were unlucky to go one nil down and end the first half behind. We have a lot of injured players and people who aren't at full fitness and having a hard time of it. A positive is that even at 3-0 down we never gave up and were attacking until the end. We're getting all our bad luck at once. I'm happy that our next game is at home where we can play in front of our own fans and stop this bad run." Reaction from our travelling fans at full time. Can't say I blame them. In other news, Brighton scored an 98th minute winner to mark a dream start to life at The Amex Stadium. After the last three weeks, I bloody needed this, I can tell ya!